When you happen to customize a pair of shoes for the brand you grew up obsessing over chances are many pieces had to fall into place. Can you imagine the pressure of a project like that? What about two pairs? Personally I could pick out a couple handfuls of customizers who have probably felt the struggle of creating the ideal pair for a somewhat similar situation. A common topic of discussion in that group would probably be thoughts of giving up. But this project is by far one of the most unique I’ve come across in the world of custom sneakers. In this interview Van Monroe shares some advice on getting the work done in this interview about his customs for Michael Jordan and David Stern. PaintOrThread: Getting commissioned by THE Jordan Brand, is something very few artists get a chance to do. What was your initial reaction once you began talks with them for this project? When did the discussion begin? Van Monroe: Talk began in early 2014, I was excited and humbled by the opportunity but simultaneously the enormity of what the project represented left me restless. The 30 year Jordan project was presented to me while I was working on a special David Stern sneaker that JB had commissioned me for as well. Back to back heart stoppers. What a blessing. The Stern shoe was a retirement gift from JB to celebrate Stern’s tenure as NBA commissioner. The concept behind the shoe (which was an AJ1 as well) was to showcase highlights in both Stern’s and MJ’s careers. The common thread was that they both entered the league at the same time and essentially grew the NBA brand together. One of the highlights of the Stern shoe was a visual timeline, from 1984 to their retirement, that wrapped around each shoe at the heel counter. The images for the Stern shoe has never been released. It was agreed upon that the shoe will remain private for Mr. Stern, but if any of you were privy to entering his office last year, legend has it that they were and or are on display there. PT: Did Jordan Brand give you free range or were there guidelines or an idea they wanted to see? VM: JB gave me an idea of what they wanted the 30 year shoe to represent along with a few specific images. After that they cut me loose. Prior to the actual painting process, I sent JB a mock draft to give them a visual of my creative direction. The sketch was approved and I began painting. JB made a custom all white Air Jordan 1 in Michael Jordan’s shoe size 13 specifically for both projects. PT: How did you decide on what to include for each pair? I can’t imagine having to narrow down 30 years worth of ideas. VM: The most difficult task was making everything flow aesthetically. This is a project that fits more comfortably as an ESPN 30 for 30 episode but I know this was an opportunity to grow as a creative. I decided to pay homage to the first 8 Jordan shoes by intertwining notable elements of each sneaker through out my design. The first 8 were not only the foundation of the brand but they were also game changers in the footwear and marketing industry. Furthermore, the last shoe he wore before his first retirement was of course the AJ8, since it was not possible to represent every pair I thought this was a responsible place to stop. I did my best to honor the other great pairs of the Air Jordan line through the laser design on the vamp. PT: The end result of the “30 Years” pair showcases a few significant images of Air Jordan marketing, did you have a favorite Air Jordan advertising campaign or commercial growing up? VM: Absolutely, my favorite campaign was definitely the Spike Lee runs featuring his timeless character Mars Blackmon who of course originated from Spike’s breakout film She’s Gotta Have It. It’s so rewarding working with Mr. Lee now because he was one of the main people who inspired me as a child. PT: How long did the full pair take from brainstorming to mock up to painting? VM: The whole process took a few months to complete. The people at JB were very patient and I thank them for hanging in there with me. Aside from the weight of these two projects, I was going through a terrible storm in my life away from art. It was an extremely stressful period and neither my personal life or nor my passion yielded an outlet. Emotionally I was boxed into a corner. For weeks I sat in my studio on the brink of depression from personal issues while staring at two all white size 13 shoes that were to represent the careers of the two most influential people in the basketball world since 1984. My spirits were soaked by the downpour of uncertainty, the dark cloud of despair whispered to me more times than I’m willing to admit. My faith is all I had left, and it was only by the grace of God that I made it through those troubling months. With adversity encamped all around me, in my humble opinion I created some of the best art of my young life and to God be the glory. Adversity has no chill, no timetable, no prejudice, and no sign of letting up until its job is done. It will either make you quit or make you stronger…ultimately the choice is yours. PT: You’ve made shoes for a list of pretty well known individuals, where do these pairs rank? PT: Often times the goal is to get ones art, especially custom sneakers, shared in as many places as possible…is it weird to have the pair made for David Stern, of such significance, be something not for the world to see? VM: You can look at this two ways. One is the obvious, as a sneaker customizer I would love the world to see the shoe I did for Stern. But on the other hand as an artist, there is more value in this piece because not many eyes have seen it in person. This includes people at JB because I traveled to NYC and hand delivered them hours before the exchange. The exclusivity of the Stern project adds kind of a folklore narrative to the piece, which is pretty cool. PT: Two pairs like this could easily be reason to give customizing a break for a while if not retire, is that the case or can we expect more? VM: For the past few years I’ve been laying down the ground work in preparation of taking my career in a different direction creatively. My goals are to transition into world of art direction eventually landing me a gig as a creative director some day. As for the shoes, I won’t completely retire but I will certainly re-brand myself and cater to a specific audience. I believe the customizing culture is in good shape, like I said before I’m encouraged by artist and craftsmen raising the creative bar on a consistent basis. Mache has been carrying the torch longer and more effectively than anyone in our history. He is truly the GOAT even if his humble spirit will never admit to it. My favorite sneaker out right now is the Flyin’ Hawaiian Bombers Foams by Sab One. His work really reminds me of the old days when we fully emerged ourselves in the art side of customizing. Nostalgic like a Nas, Wu Tang or BIG verse from 1994. I can go on and on. Wow! It is custom sneaker projects like this that keep us interested and excited to see new work. Van is a perfect example of how sticking to a certain style and not catering to whatever color scheme is popular to the masses can open doors others can only imagine walking through. 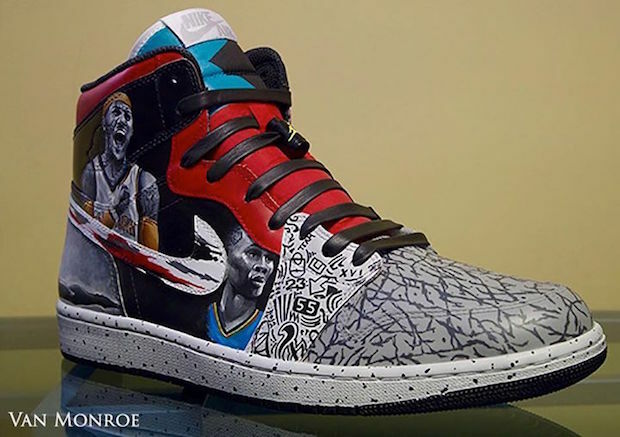 Big thanks to Van for sharing the story behind these two custom painted Air Jordan 1s.